Commercial rice production began in California in 1912. Rice is grown on approximately 550,000 acres statewide. Rice production is concentrated in the Sacramento Valley, where about 95% of California rice is grown, with the balance grown in a few counties of the northern San Joaquin Valley. 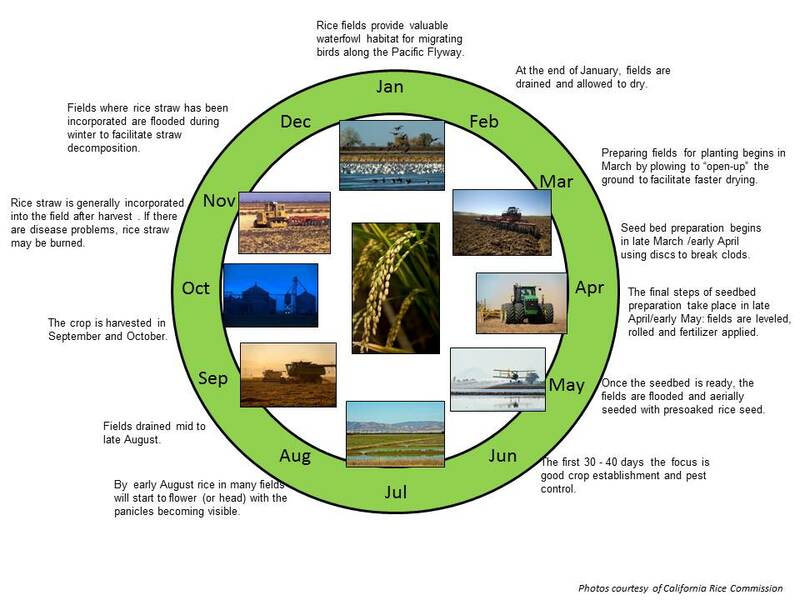 California rice production yields may exceed 10,000 lbs/acre, which is 20% above the U.S. average. Over 90% of the rice acreage in California is planted to medium grain varieties, with limited area planted to short and long grain varieties. California is unique among the U.S. rice producing states in its geography, climate and environmental regulations. The growing season is characterized by a Mediterranean climate with negligible rainfall, high solar radiation, and relatively cold night-time temperatures. Because of its dry Mediterranean climate and northern latitude of 38–40°, California varieties and many of the agronomic practices are quite different from other rice production zones in the U.S. Additionally, California’s urbanized population demands that rice (and other crops) be produced with environmentally benign methods with no off-farm impacts. There is frequently conjunctive use of farmland for wildlife habitat and other purposes.